I’ve been a bit slack acknowledging a few award nominations. The reason for the delay was because I had just recently been nominated for some awards and I wanted to space out my posts a little bit. The best thing about receiving nominations is being able to acknowledge blogs you enjoy. 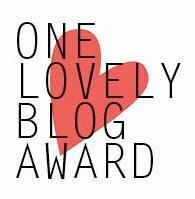 The very lovely Lea at Sea and Literary Tiger both nominated me for the One Lovely Blog Award. Thank you so much. I really enjoy reading both your blogs. • Link back to the blogger who nominated you. • Paste the award image on your blog. • Tell 7 facts about yourself. • Contact the bloggers that you have chosen and let them know about the award. I must be boring because I’ve run out of 7 things to say about myself. So I thought I would recommend 7 books that I like. 1. Frenchman’s Creek by Daphne du Maurier is a lovely read. Daphne du Maurier is one of my favourite ‘classic’ authors. Dona, a rich and bored English housewife, is staying at her husband’s estate in Cornwall and discovers that a boatload of French pirates have been using a creek on the property as their hide-out. What’s Dona to do? Fall in love with the French captain, disguise herself as a cabin boy, and go out on a raid with them. But then Dona’s absent husband comes to visit … Also check out Jamaica Inn by the same author. 2. Pillars of the Earth by Ken Follett is an epic fictional saga about the building of a cathedral in 12th century England. It also explores the lives of people during this time – from stone masons to wool merchants. This book encouraged me to go and see some of Europe’s most famous cathedrals. 3. The Bronze Horseman by Paullina Simons is one of my favourite ‘romantic’ reads. This is book one in a trilogy about Tatiana and Alexander, two young Russians who meet in Leningrad during World War Two and fall in love. Alexander is an officer in the Red Army – and it turns out he is also the boyfriend of Tatiana’s sister, Dasha. Cue star-crossed, war-crossed lovers and plenty of drama and angst. 5. Gone with the Wind by Margaret Mitchell is one of my favourite books. Was there ever a more selfish character than Scarlett O’Hara? But for all her faults, she is a character you can’t help but admire. And Rhett Butler is perfect as a scoundrel with a conscience. I also love all the historical detail about the American Civil War. It made it so much easier to study this period of history in high school after reading this book. 6. The Chronicles of Narnia by C.S. Lewis was one of my favourite series when I was a kid. I thought it was so cool that there was a fantastical world that could be reached through a wardrobe and I loved Aslan the lion. It was interesting to read this series again as an adult and interpret the books in a whole different way. This series fired my imagination then and still does now. Thank you to Amanda at amandameetsbook for nominating me for The Versatile Blogger Award. This is my 2nd time accepting this award. • Next, select 15 blogs/bloggers that you’ve recently discovered or follow regularly. • Nominate those 15 bloggers for the Versatile Blogger Award. As I already nominated some great blogs at the start of this post, I will just nominate a handful of blogs that I have recently discovered. They are all a fantastic read.